De Beers Draughtswoman Ruusa Emvula Urges Women To 'Get Out Of Your Comfort Zone'. 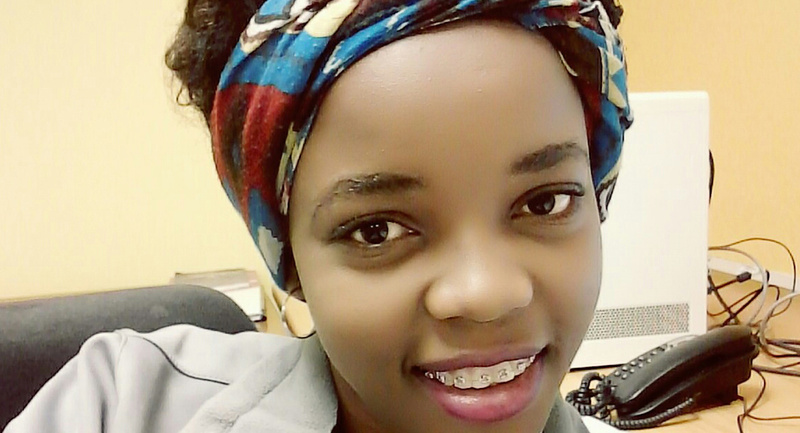 Draughtswoman Ruusa Emvula has drawn up some clear plans for her role as a woman in the mining industry. I have been working in the mining industry for about a year. I was pleased to work for Namdeb because I believe it’s a company that provides a strong core competency and a value system. I always wanted to work for a company where I continue to learn, grow and contribute as much value as I possibly can. I congratulate Namdeb on being one of the mining companies giving equal employment opportunities to women, and I firmly encourage other mining companies to do the same. I come from a big family near Ondangwa. I am the first-born with seven siblings. During my non-working hours, I assist some students in Oranjemund with their homework and assignments, and also enjoy taking long walks. I am a keen netballer and I look forward to starting a team in the near future. I am a boilermaker by trade, a product of the Namibian Institute of Mining and Technology. I later went to the College of Cape Town, where I completed my studies in mechanical engineering. I have almost four years’ experience, gained mostly from the ship repair and marine engineering environments, where I worked as a CNC (computer numerical control) operator and programmer (a CNC is a machine used in the design process), and as a draughtswoman. Since being in the mining industry, I have learnt to prioritise my responsibilities so that I have a clear idea of what needs to be done at the end of the day. I have disciplined myself not to take chances. I learned to build a strong bond with my seniors, who have been in the mining industry for a long time, allowing me the opportunity to learn from them, because working as a team is very important in this industry. One of the highlights of my career here has been designing a fire and ambulance shed. I felt proud seeing it constructed and equipped to a high standard. It was my first task on a civil project, as I am more skilled in the mechanical field. A challenge most women face in mining, and almost every sector, is raising children while achieving career goals within a corporate structure. Work-life imbalance is another noticeable challenge that women of today face at the workplace, seeking to combine their personal life with their professional career. Therefore, we need to set our priorities right and plan well ahead. I will be getting married later this year, and I am well prepared for the work-life challenge ahead. I am working in a male-dominated area and my experience has taught me to avoid taking things personally. The idea is to challenge your male counterparts while maintaining mutual respect. As a woman, you cannot expect to receive special treatment just because of your gender, but rather work hard and learn as much as you can while you are at it. So, my fellow women, get in there and give it a good go. My story at Namdeb is still being written and so far the current chapters are good and filled with colleagues who go out of their way to help me grow in my role as a draughtswoman (I think I am the first draughtswoman to be employed by Namdeb). I continue to study. My career is not ending in the drawing office, but in the field of project engineering. Therefore, I am pleased to have been given the opportunity to focus on other engineering fields such as civil and electrical and not just mechanical. In the drawing office, I am able to open my mind widely by visualising what to do tomorrow as a project engineer. To my fellow women, I say ‘follow your dreams’ and prove to the world that you are equally capable. We as women need to get out of our comfort zone and realise the endless possibilities that the world has to offer.